Scotland's politicians have clashed over the economic case for independence. Opposition leaders said new oil revenue figures had shown that the prospectus put forward in 2014 was "bogus". 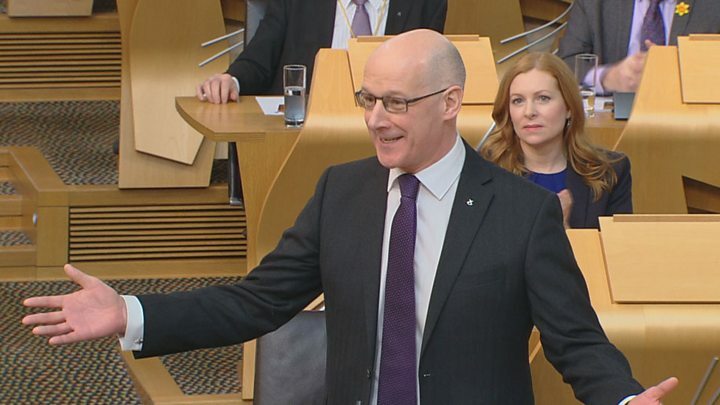 John Swinney, standing in for Nicola Sturgeon at first minister's questions, said oil was considered a "bonus" in the economic plans for independence. The head of the SNP's "growth commission" has said future arguments should not include oil revenues. Andrew Wilson has been tasked with shaping future economic policy by Ms Sturgeon, and he told the BBC that oil was "baked into the numbers" and "was indeed a basis" in the campaign. Both Scottish Conservative leader Ruth Davidson and Labour's Kezia Dugdale questioned Mr Swinney on oil and gas figures which were published as part of the Westminster budget process. The government had predicted North Sea revenues of up to £7.9bn in 2016/17 and of up to £11.8bn in 2017/18 prior to the 2014 referendum. The Office for Budget Responsibility now projects receipts of about £4.6bn over a three-year period from 2017/18 to 2021/22. Image caption Ruth Davidson said the economic case for independence in 2014 was "bogus"
Ms Davidson said the fall in forecasts showed that "the entire economic prospectus on which the SNP based its entire case for independence was bogus". She added: "Oil receipts have absolutely collapsed and there is a simple question that the people of Scotland now have, and the question is this: without those oil receipts, can the deputy first minister point to any independent analysis that shows that Scotland's economy would fair better right now if we were outside the United Kingdom?" Mr Swinney, standing in for Ms Sturgeon while she attended the opening of a war memorial in London, said oil was considered a "bonus" in the Scottish case, adding that it had "propped up" the UK economy for many years. He said: "The prime minister, he was here in Scotland in 2014 saying there would be a massive oil bonus for Scotland if we voted no, and of course there were other promises made to Scotland if we voted no. "Oil, carbon capture, European Union. The no campaign was shattered by these broken promises." What John S. contrived to do was to sidestep a question. Twice. But he did so with such panache and chutzpah that he had them roaring. To recap. Two BBC interviews have caused a bit of a stushie in polite - and no doubt impolite - political circles. In one, Andrew Wilson, who chairs the SNP's economic growth commission, said that North Sea oil had helped form the core of the independence offer in 2014. And that such would no longer be possible, given the subsequent decline in oil revenues. Ms Sturgeon said it was "common sense" that the window of opportunity was around that time, given that it was necessary to await the emerging shape of Brexit in order to offer a credible counterpoise. However, she declined to specify anything, including whether there will be a further plebiscite. Nevertheless, both issues - oil and independence - confronted Mr Swinney. Ms Dugdale picked up on the same point, arguing that the SNP gave Scots "false hope" based on "a false prospectus" in 2014, adding that the case for independence was now "in tatters". She said: "Before the independence referendum, John Swinney said, 'The early years of an independent Scotland are timed to coincide with a massive North Sea oil boom'. When yesterday, the OBR confirmed that North Sea oil and gas actually cost the Treasury money last year. "So, can the deputy first minister tell us, why didn't the SNP tell the people of Scotland the truth about oil?" Image caption Kezia Dugdale said the SNP had given people "false hope" based on a "false prospectus"
Mr Swinney prompted roars of laughter from the chamber as he gestured to the Labour and Conservative benches and saying that "at the first available opportunity they've come back together again", an apparent reference to the "Better Together" campaign in 2014. Gesturing at the Conservatives, he added: "I would have thought after the calamity that Kezia Dugdale led the Labour Party into in the 2016 election she might have learnt to have nothing to do with that lot over there." Oil also featured briefly in the questions from Green co-convener Patrick Harvie, who said the SNP and other parties were clinging to a "shared, desperate attachment to the economics of the fossil fuel industry". He also highlighted "serious omissions" in the government's draft climate change plan, which he said was "barely half-baked". Mr Swinney replied that all MSPs should be proud of the government's achievements in hitting emissions targets, with more scrutiny of the climate change plan to come. The deputy first minister also clashed with Tory members Adam Tomkins over life expectancy and Douglas Ross over police IT systems.